In the winter months, it’s often a challenge to come up with enough fun activities for your kids to be doing at home besides watch tv and sink into their screens. Believe it or not, there are plenty of STEAM and STEM activities out there that are fun, easy, and educational: the perfect recipe for a weekend project. For those who don’t know, STEM stands for Science, Technology, Engineering, and Math. These subjects have seen an increase in focus over the past several years due to the rise in technology in our own daily lives, and the demand for future jobs in those areas. STEAM adds “Art” into the mix, which is important to include not only because STEM activities are often surprisingly creative in nature, but also because it adds a more holistic and realistic approach to the way we live our lives. These subjects are in harmony more often than we think, rather than siloed off on their own. 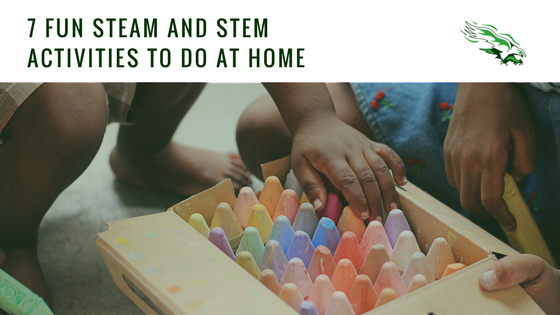 Ahead, check out our list of 7 fun STEAM and STEM activities to do at home with your kids the next time you’re all feeling stuck inside. Delicious, warming, chocolatey. This clever activity from Creative Family Fun turns a hot chocolate warm-up into a fun science experiment to test temperatures and how hot your water must be in order to dissolve a packet of hot chocolate mix. Your kids are probably already familiar with some kind of phone or computer maze game. Bring them into the real world with this fun STEAM activity that uses simple craft materials like paper plates, construction paper, and pipe cleaners. Challenge your kids to create obstacles on the paper plate using their materials, and then see if they can get their marbles through the maze. Turn this activity into a bigger one by taking a field trip to Kansas City’s own Moon Marble Company where they can see how marbles are made and then pick out their very own marbles to use in their mazes. Have fun engineering a building made from candy! Simpler than a gingerbread house, this project uses simple jellybeans and toothpicks to plan, imagine, and build a building structure. If you have little ones at home, this activity is fun and easy for them to try too. Older kids can work up to bigger, more complicated shapes and structures, and even test their strength. Every kid loves to color, so why not turn this everyday activity into a bigger science experiment? Make your own paper kits can be purchased inexpensively (for around $5 - $10). This project can also help teach kids about recycling, as you can use scrap paper, soaked in water overnight, to create the paper pulp you’ll use to make your new sheets of paper. Kids can even add their own embellishments to their paper, from glitter to confetti! Once it’s made, they can create art drawn on paper they made themselves: pretty cool. If you’re already reading out loud with your kids every day, this idea is a fun way to bring those books to life and create opportunities for STEM projects from your reading. For example, Teachers Are Terrific suggests reading the Mem Fox book, Tough Boris about pirates with your child or children. Then talk about the pirate’s ship and have them design boats of their own. Winter means dry, indoor weather from forced heat and we often end up getting shocked from the static electricity we create. Turn your kids’ questions about this into a fun project that combines a science experiment with an art craft! All you’ll need is tissue paper, construction paper, scissors, glue, cardboard, and a balloon — and perhaps some googly eyes. Once you’ve made your butterfly, blow up your balloon and have fun making the butterfly’s wings move and fly from the static electricity transferred by your balloon. Help! Can your kids build a flotation device to keep their favorite action figure, animal, or Barbie afloat? Found on Teachers Pay Teachers, this activity is still a fun one you can easily do at home with simple, dollar store materials. Let your kids’ imaginations run wild about the kind of situation their toy has found themselves in, and then together, build a device that will help them float out of it.